Upholstered furniture, Leather furniture, Carpets and Rugs. In Home Service can help keep all your home furnishings looking showroom new for as long as you own them with our MagiSeal protection products and professional cleaning services. Our knowledgeable staff can help you find a solution that meets your needs and your budget. We offer convenient daytime, evening and weekend appointments with our certified service technicians. 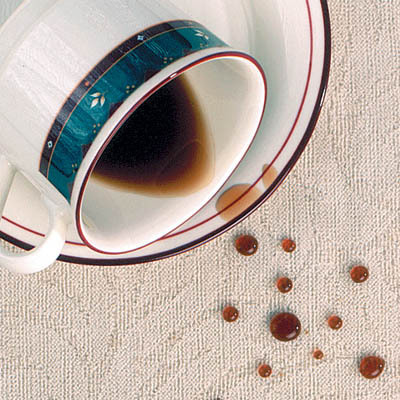 Protective coating that helps prevent common household spills from becoming permanent stains. Fabrics protected with MagiSeal have improved water-resistance and oil-resistance. In fact, most liquid spills simply bead-up on the surface of the fabric, where you can wipe them up, without a trace. MagiSeal allows for a quick and easy cleanup. How it works ? The best thing about MagiSeal Protection Plans is the simplicity. Just ask for MagiSeal Protection Plans when you are purchasing new home furnishings from your trusted furniture retailer. They will send a work order to our office, and we'll take it from there. Step 1: Our Customer Service Representatives will contact you immediately after delivery to arrange a convenient service appointment. We provide daytime, afternoon, evening and weekend appointments to help fit your busy lifestyle. Step 2: Our uniformed Service Technicians will arrive in a timely manner for your scheduled appointment to properly protect your new home furnishings. Service appointments usually take about half an hour, although your furniture will need three hours to dry before you use it again. 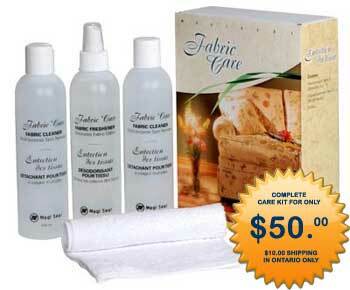 Step 3: Our Service Technician will apply a coating of MagiSeal fabric protection to your new home furnishings. Our protective products are water-based, non-toxic, environmentally friendly products designed to improve your fabric's water-resistance and oil-resistance, effectively creating a stain proof barrier around each and every fiber, without changing the original colour or texture of your fine fabrics. Once dry, MagiSeal fabric protection will prevent normal household food and drink spills from becoming permanent stains. They will simply wipe up without a trace, and that's what fabric protection is all about: a quick and easy cleanup. Step 4: In the event that an accidental spill cannot be removed, our service technicians will be dispatched to your home to correct the problem, free of charge, as many times as you may require over the next five years. MagiSeal Leather Care is a professionally hand-applied treatment for leather furniture that provides two main benefits; by maintaining the proper moisture level it prevents leather from drying out due to premature moisture loss (which can lead to cracking and splitting) and it also creates a protective barrier against common household spills and stains. How it works ? 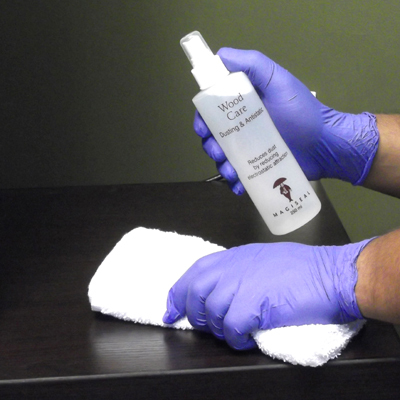 Step 3: MagiSeal Leather Care is hand-applied to your new leather furnishings, maintaining the proper moisture level while enhancing leather's natural stain resistance. Our protective products are water-based, non-toxic, environmentally friendly products designed to improve leather's water-resistance and oil-resistance, effectively creating a stain proof barrier without changing the original colour or texture of your leather. Today's carpet and rug fibers resist soiling and stains, but that doesn't mean they are stain-proof. Soil and stains cling to fibers and quickly become ground in. MagiSeal keeps soil from bonding to carpets and rugs by forming an invisible protective barrier around each carpet fiber, making cleanup and spot-removal easier. How it works ? 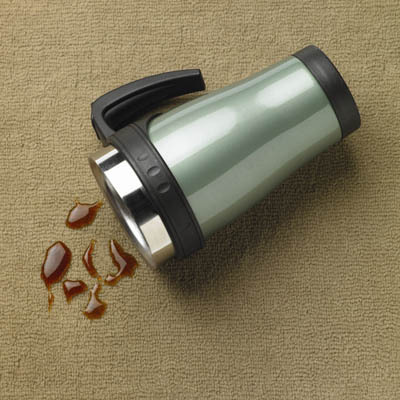 Step 3: Today's carpet and rug fibers resist soiling and stains, but that doesn't mean they are stain-proof. Soil and stains cling to fibers and quickly become ground in. MagiSeal keeps soil from bonding to carpets and rugs by forming an invisible protective barrier around each carpet fiber, making cleanup and spot-removal easier. Wood displays a look like no other type of furnishing. In order to preserve the look of your wood, it is important to regularly maintain wood furnishing by dusting and polishing the surface. Common problems that arise on wood furnishings are scratching, scuffing, spills and water or heat marks or rings. 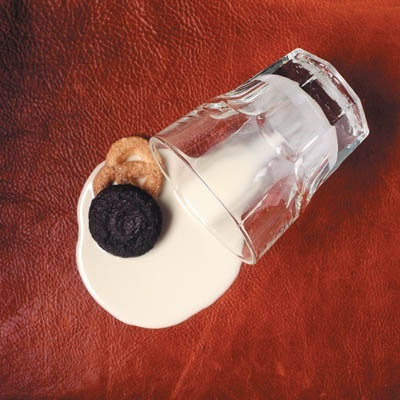 In the event of a spill, it is important to take action as quickly as possible. Using a damp cloth, rub with the grain of the wood and avoid applying too much pressure with the cloth so that the stain is driven into the wood. How it works ? Step 1: Wooden Furniture comes fully protected from the manufacturer, but it is critical to establish a routine of dusting and polishing your wood furniture to maintain its beauty. Included with your MagiSeal Protection Plan is a Wood Care Kit, which will provide you with everything you need to maintain your wood furniture. Step 2: Dust is attracted through static electricity. Dust is a primary cause of poor wood appearance and will microscopically scratch the surface if not removed gently. 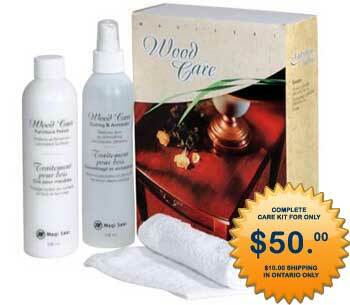 Periodically use MagiSeal Dusting and Antistatic solution included in your Wood Care Kit. as it will help reduce dust build-up on wood furniture. Apply solution to the application cloth and gently dust, avoiding circular strokes as any grit lifted from the pores will damage the surface. Step 3: Follow up dusting with periodic application of MagiSeal Wood Polish. It is highly effective at restoring wood furniture's shine and lustre. MagiSeal Wood Polish will also conceal minor surface scratches and marks. Recommended application is every second month. Apply thin coatings of the product with the application cloth included with your Wood Care Kit, by rubbing the product lightly along the grain. Remove excess product with a dry cloth, using a gentle, lengthwise motion. 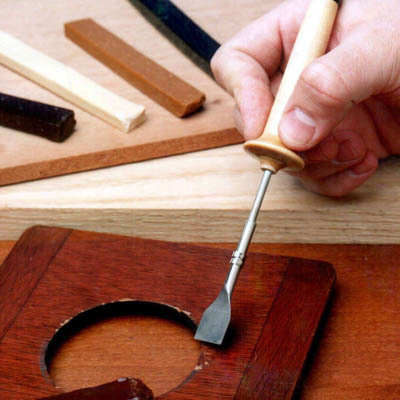 Avoid circular strokes as any grit lifted from the pores will damage the surface. Buff gently to shine. We offer full cleaning services of fabric upholstery, leather furniture, carpets and rugs, as well as mattress cleaning. Furniture cleaning is a specialized service that requires the right tools, techniques and experience to perform properly. When done right, professional cleaning will help restore the original look and feel of your fabric furniture by removing ground in soil and eliminating stains. Professional cleaning will also improve the health of your home environment by removing dust and atmospheric soil that becomes trapped in fabrics. How it's done ? Step 1:Simply call our office for a firm but fair price (all pricing listed on our website) and arrange a convenient service appointment. We provide daytime, afternoon, evening and weekend appointments to help fit your busy lifestyle. Step 2:Our uniformed Service Technicians will arrive in a timely manner for your scheduled appointment to properly clean your home furnishings. Service appointments can take between one to three hours, depending on the size of the job, but expect no less than three hours before your home furnishings are ready to be used again. Step 3:Our Service Technician will determine the correct cleaning method for your home furnishings, whether steam cleaning or dry cleaning. After a thorough inspection, the Service Technician will point out any problem areas he think may not be resolved through cleaning, so that you'll know what to expect, and then get down to work. Tough stains are pre-treated with specialized spot-removers to assure stain removal. Next, our Service Technician will prespray the appropriate detergent (or dry cleaning solution) on your fabric, and give them enough time to loosen up ground in soiling before finally using a hot water extractor to rinse fabrics free of soil and detergents. Step 4:In the event that a stain was not removed through the first cleaning, our service technician will gladly make a second cleaning attempt, and leave you with a small bottle of cleaning solution for future spills and stain removal. Spot clean this fabric with the foam only of a water-based cleaning agent such as a mild detergent or commercial upholstery shampoo. Use sparingly. Avoid over wetting. Spot clean this fabric with a mild water-free dry-cleaning solvent available in local stores. Use sparingly in a well-ventilated room with no sparks or flame in the room. The use of water-based cleaners may cause spotting or excessive shrinking. Solvent cleaning agents will not remove water stains. Spot clean this fabric with a dry-cleaning solvent, mild detergent foam or upholstery shampoo, depending on the stain. Clean this fabric only by vacuuming or light brushing to prevent accumulation of dust and grime. Water-based foam or solvent-based cleaning agents of any kind may cause excessive shrinking, fading or spotting.The most effective way to keep your upholstery clean and looking its best all the time is to vacuum them weekly or as often as you dust your end tables. Make sure you vacuum all surfaces, especially cushions, arms and decking. This prolongs the accumulation of soiling, and will add years to the life of your furniture. The most effective way to keep your upholstery clean and looking its best all the time is to vacuum them weekly or as often as you dust your end tables. Make sure you vacuum all surfaces, especially cushions, arms and decking. This prolongs the accumulation of soiling, and will add years to the life of your furniture. If your furniture has reversible cushions, be sure to reverse them every two weeks, since this will ensure equal use on all cushions. This will add to the life of the cushions. Never remove cushion covers for dry cleaning or machine washing, even though they have zippers. You will risk shrinkage or permanent damage. When overall soiling is noticeable, contact In Home Service to arrange for professional cleaning service. Never cover your furniture with dark coloured blankets or sheets since the dyes may rub off onto the fabric when dry or bleed onto the fabric when wet. Keep upholstered furniture away from direct sunlight, as the UV rays will cause the fabric to fade in colour more rapidly. Professional cleaning is the best way to maintain the appearance of your leather furniture. Soil transfer from clothes, pets and newspaper can build up on the surface, making it appear dull. Also, sources of light and heat (such as fireplaces or sunlight) can have a drying effect on leather furniture, causing your leather to feel stiff. Professional cleaning of your fine leather furniture will remove soil and free clogged pores. The final step in the cleaning process is a hand-applied coating of leather conditioner, which will help to restore your leather's soft, luxurious feel by replenishing lost moisture. How it's done ? Step 3:After a thorough inspection, the Service Technician will point out any problem areas he think may not be resolved through cleaning, so that you'll know what to expect, and then get down to work. Tough stains are pre-treated with specialized spot-removers to assure stain removal. 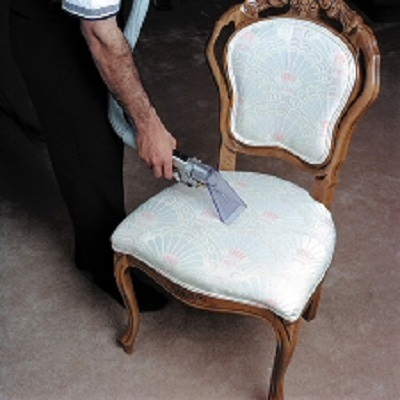 Our Service Technicians shampoo your furniture by hand to loosen ground-in soil. Fresh water is used to rinse the leather free of soil and detergent. 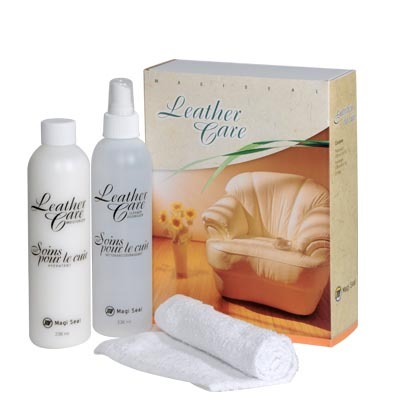 Leather conditioner is applied to fully moisturize your leather furniture. Professional Rug Cleaning is performed away from your home in our rug cleaning plant. The cleaning process is gentle enough to use on even the most delicate hand-woven rugs, yet strong enough to remove soiling ground deep into the rug fibers. The entire process is done by hand and gentle mechanical brushing, using 100% fresh water and a mild pH balanced detergent. Professional cleaning will help improve the appearance rugs by removing stains, eliminating pet odours and extracting ground in soil. How it's done ? Step 1:Simply call our office for a firm but fair price (all pricing listed on our website) and arrange a convenient appointment date. Step 2:You will receive a call from our Dispatcher between 8:00 AM and 8:30 AM on the morning of your appointment. At that point, we will co-ordinate with you a two-hour time frame, specifying when our Service Technician will arrive to pick-up your rugs. We provide daytime, afternoon, evening and weekend appointments to help fit your busy lifestyle. 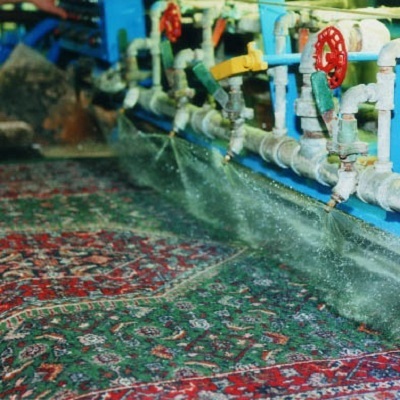 Step 3:In our cleaning plant, your rugs will be inspected, before going through a highly specialized cleaning process. They are placed onto a large conveyor belt, where jets of hot water and pH balanced detergent are sprayed directly onto your rugs. Automated brushes gently agitate the fibers of the rug, and it is then passed through a fresh water rinse, and later squeezed dry with a 3,000 lb wringer. Once your clean rug passes inspection, it is hung to dry on a large wooden rack to prevent warping or shrinkage. Rugs are kept in a temperature-controlled, humidity-controlled drying room for 2 to 3 days, before final inspection. Step 4:Your rugs are returned to you within 1 week of pick-up, correctly cleaned. 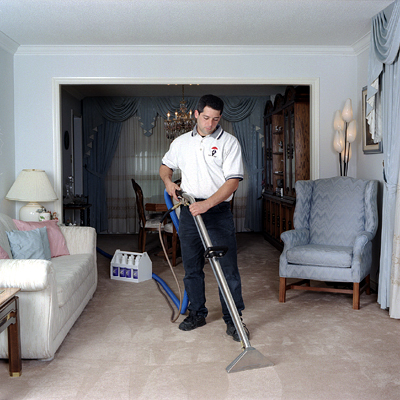 Professional Carpet Cleaning enhances the beauty of your home, and helps promote a healthy, dust-free environment. The dry soil found in carpets causes light to reflect differently, and give carpets a dull appearance. Professional carpet cleaning can help to restore the appearance of your wall-to-wall carpeting or broadloom by extracting ground in soil, removing spots and stains, and eliminating pet odors. How it's done ? Professional cleaning will help improve the appearance carpet by removing stains, eliminating pet odours and extracting ground in soil. These soil particles have sharp, jagged edges that will wear against carpet like sandpaper, causing premature fabric wear. Step 2:Our uniformed Service Technicians will arrive in a timely manner for your scheduled appointment to properly clean your carpets. Service appointments can take between one to three hours, depending on the size of the job, but expect of no less than three hours before your carpets are ready to be used again. Step 3:After a thorough inspection, the Service Technician will point out any problem areas he think may not be resolved through cleaning, so that you'll know what to expect, and then get down to work. Tough stains are pre-treated with specialized spot-removers to assure stain removal. Next, our Service Technician will prespray a pH balanced, neutral detergent on your carpets, and give them enough time to loosen up ground in soiling before finally using a 300 P.S.I. extractor to rinse carpets free of soil and detergents. Professional cleaning of mattresses will help to keep them free of mould, bacteria, allergens and other organisms living in mattresses. Our low-moisture, high- pressure system has mattresses clean and dry in the same day. How it's done ? 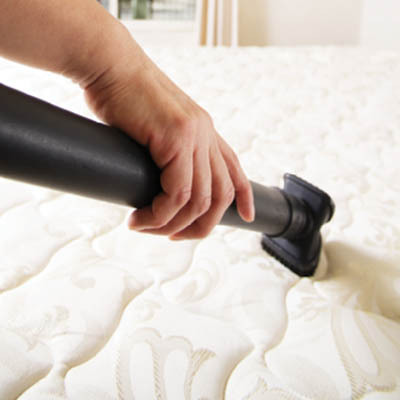 Regular mattress cleaning is vital for the health of your home environment. 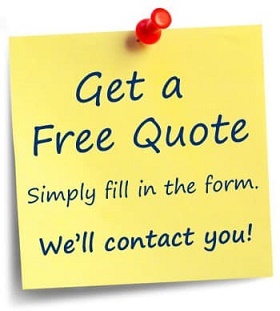 Step 1:Simply call our office for a firm but fair price (all pricing listed in our Free Quote section) and arrange a convenient service appointment. We provide daytime, afternoon, evening and weekend appointments to help fit your busy lifestyle. Step 2:Our uniformed Service Technicians will arrive in a timely manner for your scheduled appointment to properly clean your mattress. Service appointments take around an hour, but mattresses dry very slowly. You should expect no less than three hours before your mattress is dry and ready to sleep on, but this time frame can vary greatly with the ambient temperature and humidity in the room. Placing a fan in the room will speed drying considerably. Step 3:After a thorough inspection, our Service Technician will get straight to work. Your entire mattress will be pre-treated with safe, biodegradable cleaning agent. Next, our Service Technician will rinse the mattress clean with 100% fresh water, leaving your mattress clean and free of any residues. Accidents happen. Your leather furniture may be strong and durable, but it is subject to accidental rips, burns, tears and punctures that need to be repaired. Our professional Leather Repair Technicians can correct any surface damage, whether accidental or due to long-term usage. How it's done ? Step 1:Simply call our office for a convenient service appointment. We provide daytime, afternoon, evening and weekend appointments to help fit your busy lifestyle. Unfortunately, we cannot provide price quotes over the phone, as the nature of leather repairs requires a hands-on inspection. Step 2:Our uniformed Service Technicians will arrive in a timely manner for your scheduled appointment to inspect and repair your home furnishings. Service appointments take about an hour. Repaired furniture is ready to be used immediately. Step 3:Our Service Technician will determine the type of leather and the extent of the damage, and develop a repair strategy. He will begin the repair processes using specific repair compounds and techniques necessary for an invisible repair that will stand up to continued use. Finally, the repair is refinished using an exact colour matching process, and factory supplied leather dyes and pigments, to duplicate your leather furniture's original colour and shine level. We are one of very few companies in Canada with expertise in this area. 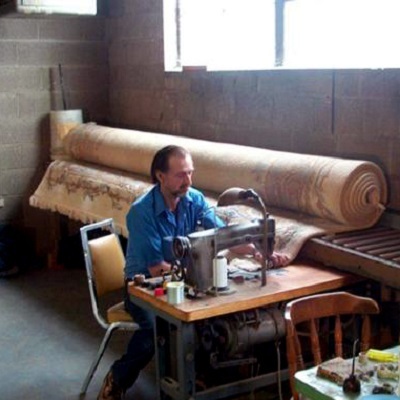 Many fine antique rugs have been brought to our restoration department over the years and all, according to their different situations, have received the care they deserve. However, your rug does not have to be a priceless heirloom or an antique to receive the same attention. Simply call our office for a convenient appointment to have your rugs picked up and brought to our workshop. We provide daytime, afternoon, evening and weekend appointments to help fit your busy lifestyle. Unfortunately, we cannot provide price quotes over the phone due to the vast number of services offered, and the complex nature of some repairs. However, if upon inspection, you do not want to go ahead with the repair of your carpet or rug, there is no obligation, just a firm price based on an honest assessment. Please fill in the form bellow and shortly describe your repair needs. Your fine wood furniture goes through a lot, especially when in a high traffic area of the home. Gouges, dents and liquid marks and rings can occur after periods of use. Our professional Wood Furniture Repair Technicians can correct those marks, and refinish your wood furniture back to its original beauty. Designed for everyday maintenance of home furnishings. Our products are designed to remove small stains, and eliminate odours, caused by common household food and beverage spills. Suitable from most types of natural and synthetic materials used in furniture, plus carpets and rugs (excluding silk and other dry-clean only materials). This kit includes specific instructions on how to properly remove spills and stains along with overall maintenance to improve the longevity of your home furnishings. Designed for everyday maintenance of leather furnishings. 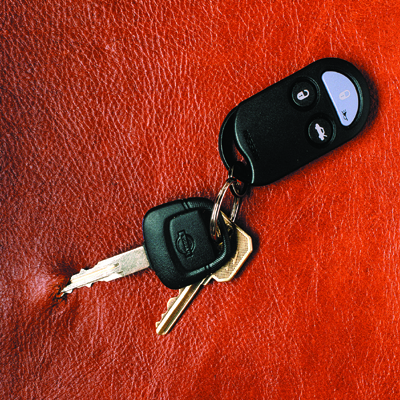 Clean and moisturize leather to improve its appearance and increase its longevity. Suitable for most types of finished, pigmented or semi-aniline leathers (excluding unfinished leather like suede or nubuck). Our Leather Cleaner is a gentle, yet effective cleaning solution, while our Leather Moisturizer is designed to restore lost moisture and improve the look of your leather, restoring it's showroom new appearance. Designed for everyday maintenance of wood, veneer and laminate furnishings. Our products will help to prevent stains, scuffs and dust on your home furnishings. The kit includes a Dusting & Antistatic solution to remove fingerprints and smudges while helping to reduce the electro-static attraction that holds dust to wood furniture. Out Wood Polish will help improve the overall luster of your wood furniture while concealing minor scratches. Contact us and we'll get back to you within one business day.